Source: European Commission – Justice. Commissioners for Justice, Consumers and Gender Equality Věra Jourová and for Digital Economy and Society Mariya Gabriel launched today a campaign to raise awareness on violence that women face online every day. They said in a joint statement: “Dignity, respect and solidarity apply to all of us, also online. European Commissioner for Justice, Consumers and Gender Equality Věra Jourová | Emmanuel Dunand/AFP via Getty Images. 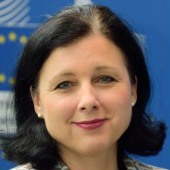 EU justice chief pitches transatlantic alliance on tech regulation. Brussels looking for tech detente after years of transatlantic tensions over privacy scandals and monster fines on US tech giants.